Jessica Blank and Erik Jensen, creators of that highly successful piece of documentary theater, “The Exonerated,” which concerned innocent people on Death Row, have done it again. Their take on the Iraq war, from the little-heard perspective of ordinary citizens, is another powerful eye-opener. Though it avoids outright condemnation of the United States, the unpleasant facts speak for themselves. 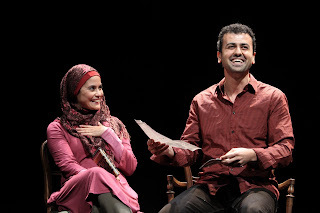 Taken from the testimony of 37 Iraqi refugees living in Jordan whom Blank and Jensen interviewed in June 2008, their play tells six stories (with a cast of nine) to illustrate the emotional and physical toll the war has exacted. The characters comprise the translator, played by Fajer Al-Kaisi, whose presence provides the glue for the varied testimony, with some of the characters opening their narrative in their native tongue, and then segueing into English. These include a theater director (Daoud Heidami) and his wife (Maha Chehlaoui), a visual artist; a pharmacist (Laith Nakli); a dermatologist (Amir Arison); an Iman (Demosthenes Chrysan); husband and wife cooks (Omar Koury and Rasha Zamamiri); and a young mother (Leila Buck). Among the accounts, all of them poignant, related here are the mother’s losing her entire family to a roadside bomb with all the pain, confusion and uncertainty that followed; the Iman, his faith ironically fostered on an American book about belief coexisting with science, incarcerated at Abu Ghraib and subjected to torture and degradation; the blood-phobic dermatologist forced to see tend to the wounded at Baghdad Hospital; and the pharmacist’s nephew – a student with no political connections – wakened in the middle of the night, and shot in cold blood. The play bears some thematic similarities to George Packer’s “Betrayed,” presented last year by the Culture Project. That concerned the American exploitation of those Iraqis working for them as translators or in other functions. Like that play, this should be essential viewing. We need to be reminded, as the pharmacist does, that the city of Fallujah, for instance, was a city whose inhabitants, for the most part, are educated – professors, doctors, pharmacists – and hospitable to a fault. Performances are very fine and authentic. 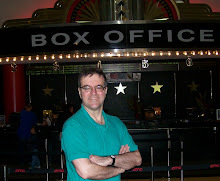 Blank’s economic direction helps the intermissionless 90-minutes pass quickly. Blank and Jensen keep the tone varied, and stress the resilience and innate optimism of the human spirit. With all they’ve endured, Blank and Jensen remind us, these Iraqis haven’t lost their enthusiasm for a rousing soccer match, nor for hope in the future.